Now iTube Studio for Mac supports downloading all videos from a YouTube channel, playlist, user page, category, as well as download Lynda playlist in one click. 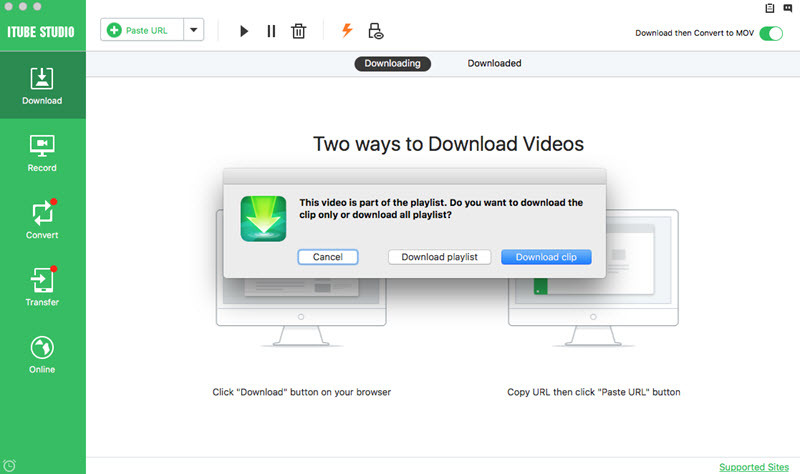 You will have 2 ways to download YouTube playlist, channel, category and Lynda playlist on Mac. When you open a YouTube channel, playlist, user page or category with your browser, you will see the “Download” button. You can click the button and select the "Playlist" option. You can copy a YouTube playlist URL from the address bar in your browser, or copy the URL from other sites. And then go the the "Download" tab to click the "Paste URL" button. And click the "Download playlist" button. You will get a pop-up window for choosing the videos from YouTube playlist. Now select the videos you want and set the video resolution. And then click "Download" to start downloading YouTube playlist.